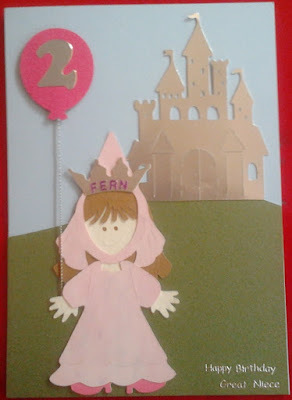 Sarah's Craft Shed: Happy Birthday Pirate Princess! Today is my great niece's fifth birthday. She had a pirate princess party last Sunday, so I decided to use this as the theme for her card. Having looked over the cards which I made for her previous three birthdays, I have noticed a pattern developing; Princess / Seaside themes. This year just happened to combine the two! I went back to an old favourite of mine; the Paper Doll Dress Up cartridge and my Cricut machine. Using a mixture of the pirate and princess characters, I layered up the outfit, cut into the dress to make it shorter and add an over dress, as well as adding gold buckles and edging to the hat and dress using Nuvo Crystal Drops in Bright Gold. The background was created on an A5 piece of kraft card. 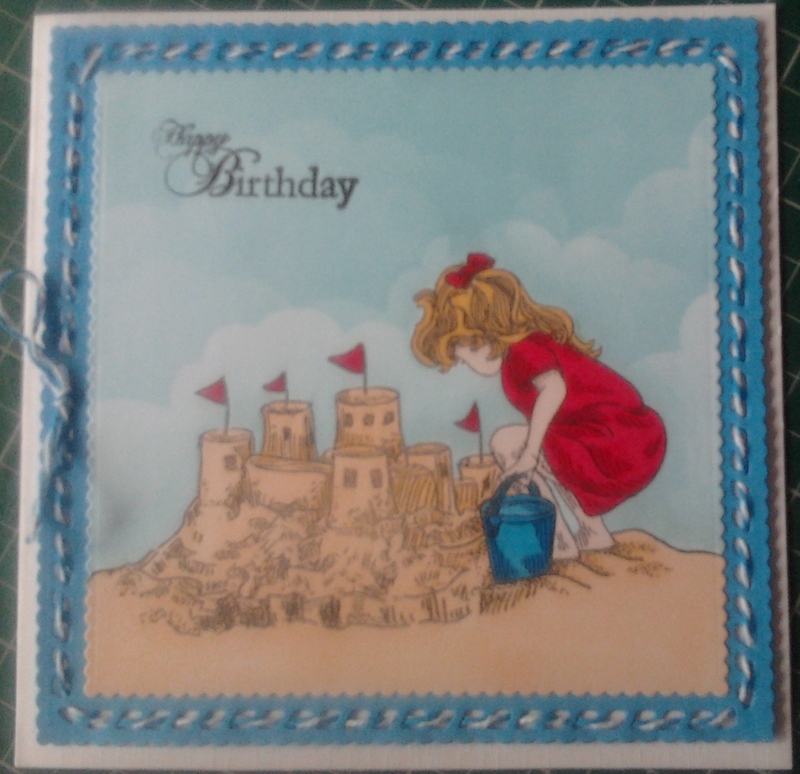 I had found a small piece of beach/sand scrapbooking paper by DCWV and wanted to create an ocean/sky to go with it. I love the metallic gilding polish by Cosmic Shimmer, but didn't want a bright shiny look - more of a muted finish while retaining the shimmer. The Ocean Teal and the Mediterranean Blue colours came out exactly as I wanted them on the kraft card; an iridescent finish but not a shiny, smooth one. I then added some sea foam; firstly using some of the Pearl White Nuvo Crystal Drops and a brush, then with Pebeo Modelling Paste and a palette knife for more emphasis. Finally I tore along the edge of the scrapbook paper before gluing it to the bottom of the panel and trimming it to fit. I stamped and coloured an old treasure chest by Dimension Fourth, which is no longer available and added the Happy Birthday (a Crafter's Companion die), the number 5 (X-Cut Carnival Numbers) and the Pirate Princess figure to complete the card. The scene was glued to an A5 black card blank.